Professional northern filmmakers, digital artists and photographers continue to capture the beauty of the land and tell the stories of its people on film. The northern landscape is so unique and different from any other part of the world, that people are mystified and entranced by images. For many, the images and footage captured by artists provide a sneak peek into the incredible Northwest Territories (NWT). Western Arctic Moving Pictures (WAMP) is the territory’s film and media arts organization. The mission of the non-profit organization is to produce, support, showcase and promote film, video, and digital media throughout the Northwest Territories. Throughout the year, WAMP hosts several events and festivals that help to foster this growing industry in the North. 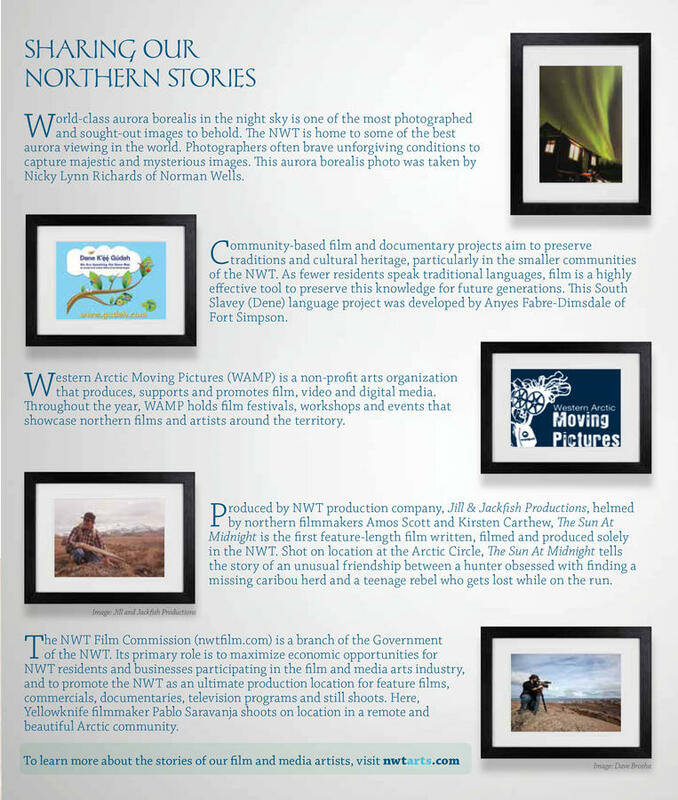 The Northwest Territories Film Commission is a branch of the territorial government and while established in 1999, has just recently begun to develop with the booming film industry. The primary role of the Commission is to promote the NWT as an ultimate production location for feature films, commercials, documentaries, television programs and still shoots. ​The NWT Professional Media Association has a mandate to enhance and promote the professional film, television and media industries in the NWT. The association was formed in 2011 to represent its members by lobbying and taking part in consultations with government and other industry stakeholders. Members of the NWT Professional Media Association are professionals working in the film, television and media industries in the NWT. The Association is encouraging other professionals working in the industry in the NWT to join its ranks, especially those living outside of Yellowknife.